LaundryCares invites all to join in for a family-friendly and fun afternoon of free laundry. On July 28th, 2016 LaundryCares Foundation will host a Free Laundry Day in Baltimore, MD from 1PM until 5PM. 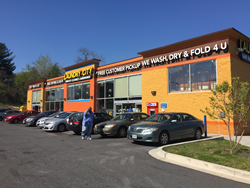 The event will take place at Laundry City, located at 5200 Moravia Rd. Baltimore MD 21206. LaundryCares invites all to join in for a family-friendly and fun afternoon of complimentary laundry. The foundation hopes to add the upcoming complimentary laundry days to the list of other successful outreach attempts accomplished since its inception. Hundreds of loads of laundry are completed during each Free Laundry Day, and the 28th will be no exception. The 28th is part of a concerted charity effort by the LaundryCares Foundation to provide laundry services and education to those in need. The Foundation was created by the Coin Laundry Association and has a long-standing history of supporting the self-service laundry industry. Members of LaundryCares are always eager to give back to the individuals who support their businesses. Anyone interested in giving back to their community is asked to consider participating in the form of a tax-deductible, charitable donation to LaundryCares. For information on how to donate, please visit the donation page on EventBrite.